Andra Day truly had a moment (or 12) as she created her own personal photo shoot (even laying down!) on the red carpet of the 2018 Oscars in Los Angeles on Sunday (March 4). The singer and performer wore a Zac Posen Spring 2018 gown, which really makes me wonder who exactly the designer had in mind when he created it. I really took my time digesting this look, because I wanted to appreciate the unconventional nature and the art of it all, but unfortunately, I never got there. 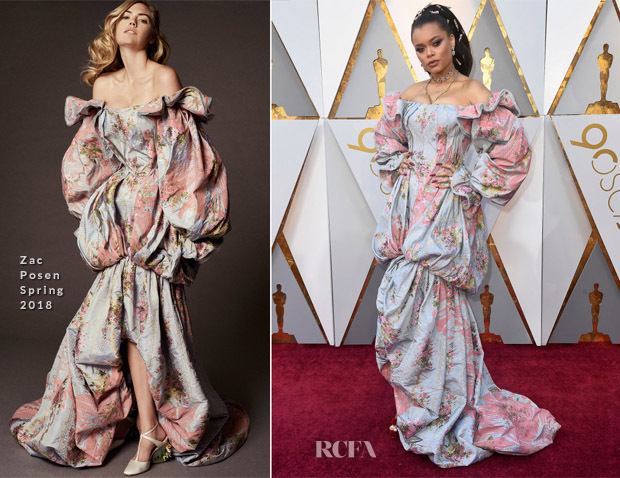 It’s not even just the intentional volume and haphazard seaming–the fabric is simply ugly. It looks much more elegant in the look book, but in person, it is garish. Her makeup, however, is gorgeous and really is the perfect drama to compete with such a dress.